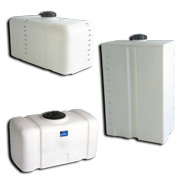 Flat bottom utility tanks have been designed with residential and commercial applications in mind. UV Stabilized for outdoor use. Suitable for potable water - resin complies with U.S. Food and Drug Administration regulation 21CFR 177.150(c) 3.1 and 3.2. Tanks include molded-in grooves for stability and easy tie-down. Tanks are very durable, yet lightweight; easy to install and clean.